MAY 15 – Partnership for a Secure America (PSA) and the United States Institute of Peace (USIP) hosted a small off-the-record lunch roundtable on May 15th featuring a discussion of the Syrian conflict and its impact on Iraq and the greater Middle East. Manal Omar– [Associate Vice President, Center for Middle East and Africa, USIP]. With the Syrian conflict becoming more intractable, effects of the war are spilling over into neighboring countries posing greater challenges to U.S. policy in the region. The discussion will focus on the effects of the continued crisis in Syria upon the stability of the region. The conversation will touch on the humanitarian, economic, political and cultural challenges posed to the regional governments, in particular, the rise of sectarianism, the large numbers of refugees entering into the surrounding countries and the spillover of violence into Iraq. 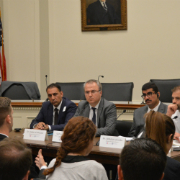 This was the 13th event in the PSA/USIP Congressional Briefing Series – Topics on International Conflict Resolution and Prevention, an educational program designed to provide congressional staff with opportunities to engage leading experts and fellow Capitol Hill staffers in bipartisan forums. The program aims to build cross-party relationships, encourage bipartisan dialogue, and equip staff with new perspectives on critical issues in the international conflict resolution and prevention field.